“The eyes of the world are yet again on the island shared by the Dominican Republic and Haiti. Yesterday, an arbitrary deadline passed for the registration of all so-called undocumented immigrants in the country, and the aftermath could be devastating. Recently, the Dominican Republic changed its constitution to deny the citizenship of hundreds of thousands of people born in the Dominican Republic—an unprecedented act that created the largest stateless population in the Western Hemisphere. As a result, thousands of people, including those who are Dominican-born, are at risk for deportation from the Dominican Republic, which would whisk them away from their homes, livelihoods and families and send them to neighboring Haiti, a country that many of them do not relate to as their own. “We absolutely deplore this dire and looming threat to the men, women, and children in the Dominican Republic who are being denied their fundamental right to a nationality. “While mass deportations are clearly a concern in any context, the situation in the Dominican Republic is particularly troubling because of the recent decision of the Dominican Constitutional Court to strip citizenship from more than 200,000 Dominicans who were born in the Dominican Republic but are of Haitian descent, rendering them stateless. They now face the impending threat of being deported to Haiti—a country where most of them have never even set foot, and where many do not speak the language. “The imminent deportations are not only ethnically-motivated; they are the latest effort in a long and systematic plan by the Dominican government to demonize people with dark skin and Haitian-sounding last names. “AJWS’s grantees in the Dominican Republic have fought for the human rights and dignity of Dominican-born individuals and Haitian migrants for over 15 years. Over the last decade, AJWS has granted $1.5 million to 16 grassroots groups in the Dominican Republic that are working on behalf of these vulnerable populations. “We stand in solidarity with Dominican-born communities and Haitian migrants throughout this time of fear and panic. As Jews, we are acutely familiar with the pain of persecution and statelessness, as Jews themselves endured at the hands of oppressive governments, such as Nazi Germany. “We firmly believe that the Dominican government must immediately restore citizenship for those who have been denied their nationality. 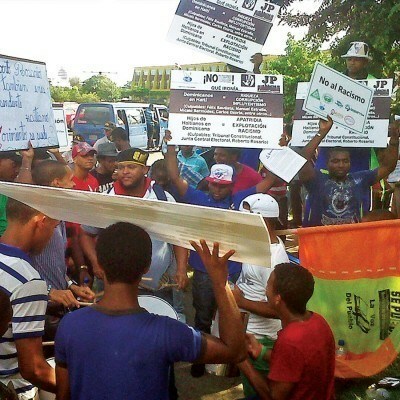 The international community cannot stand idly by while state-sanctioned ethnic discrimination—truly a human-made disaster—destroys the fabric of the Dominican Republic for decades to come.